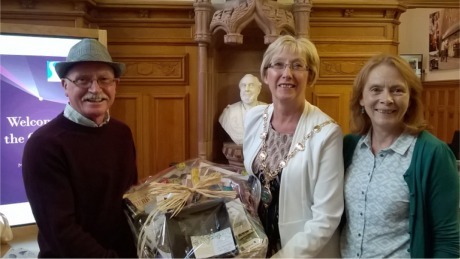 DERRY Mayor Alderman Hilary McClintock has marked the milestone of the Guildhall’s millionth visitor since the completion of major restoration at the historic building in 2013. The iconic landmark, which is the local civic hub and home to the city’s Mayor, was transformed following the complete regeneration of the building and the introduction of a range of enhanced visitor services. “Since the restoration we have had so much interest in the building, which is used now for a wide range of purposes from a stunning events venue to an exquisite wedding location. It’s a real treasure in terms of the city’s built heritage and tourism offering," she said. Named in honour of its connection to the City of London and its Guilds, The Guildhall was first opened in 1890, financed by The Honourable Irish Society. A focal point for locals and visitors alike, the building boasts some of the finest examples of stain-glassed windows in the whole of Ireland. Also on display is an impressive exhibition on The Plantation of Ulster, and one of the most beautiful attractions of the building is the 3132 pipe organ, which was originally financed by public subscription in 1914.